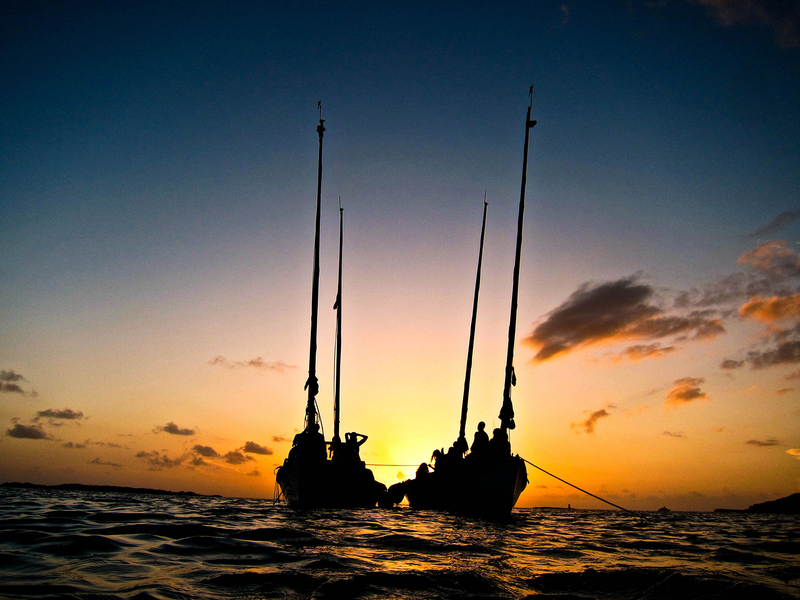 Lying on the decks of the Sharpie Schooners we watched the sun peek over the wide open expanse of Caribbean Sea. Our morning routine began like this most every day. Wake up at six, put away the sleeping boards, sing the Bahamian national anthem, jump in the water for a morning swim, climb back on the boats for breakfast and chores. Finally when tasks were completed and crew members were dressed in full sun protection, the sails came out and we were off. 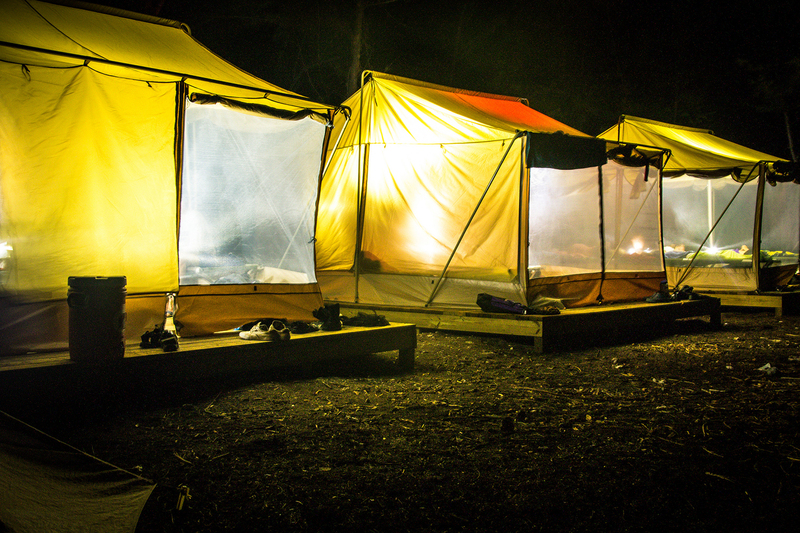 Our expedition started on the 22nd of June when the expedition team took up residence at the newly constructed basecamp, located behind Water Polo Cut, which features tent platforms, an outdoor shower, fire pit, and a “private” beach. After dinner and some time to settle in, we circled up in the boat house to discuss expectations. That first night we acknowledged what an amazing and challenging opportunity this course would be for everyone involved. It is my strong belief that to adventure in the natural world one must be present. One must establish a sense of place, a bond and relationship with the land. Place-based education challenges the meaning of education by asking seemingly simple questions: Where am I? What is the nature of this place? Students are presented with the opportunity to become a part of the broader community rather than an indifferent observer. The Island School promotes this type of learning, and this course was no exception. We spent the first week of the term on campus on learning the basics of sailing skills, marine ecology, and expeditionary living. We were pioneers plotting our journey into uncharted territory. Finally, we were ready. And so, we went. Our expedition departed Eleuthera in the pre-dawn hours of June 30th, setting the course west 30 nautical miles across the rolling waters of the Exuma Sound. A true epic crossing was had, complete with compass and charts, waves washing over the gunwales, deep blue water, and a touch of seasickness. After eight exhilarating hours, land was sighted. Shortly thereafter we arrived at Halls Pond Cay, our first stop in the Exuma Islands. Anchored off a white sand beach in turquoise water, an initially exhausted crew got second wind. Our first afternoon in the Exumas was spent relaxing in the shade of trees, and snorkeling the nearby reef. The students and Island School teachers were equally thrilled by the abundance of tropical fish and other marine species. Every so often someone (mostly me) could be heard exclaiming in excitement through their snorkel, a practice that continued for the duration of the trip. The next morning we traveled to Warderick Wells Cay, headquarters of the Exuma Land and Sea Park. We were met by a staff enthusiastic about our endeavor, and happy to spend some time talking with our group. Throughout the afternoon we learned about the marine protected area, fishing regulations, the Bahamas National Trust, and the history of the Exuma Islands. The time spent at headquarters helped the students to conceptualize the importance of their scientific studies on a large scale, and served as the launching point for their research. 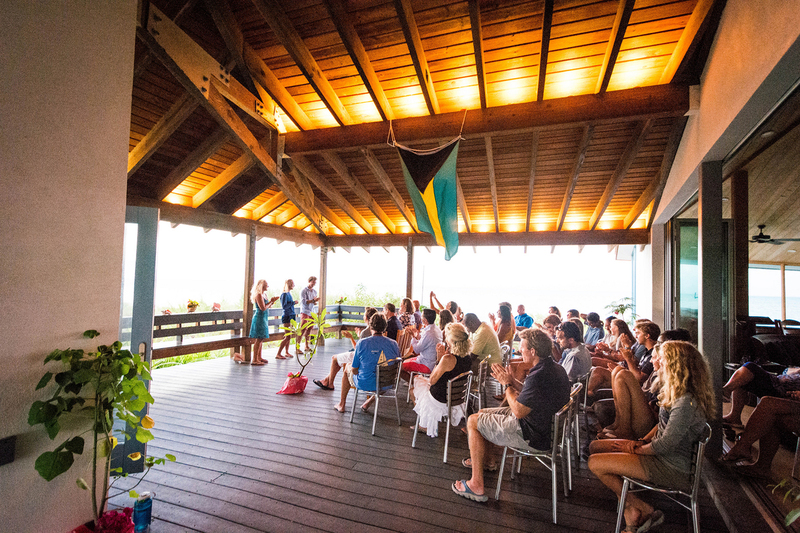 At the beginning of the program during our on campus week, students were presented with four on-going research projects through the Cape Eleuthera Institute (CEI), and then chose to take on the project which most interested them. The topics of these projects included Queen Conch, sea urchins, lionfish, and grouper. The bulk of our expedition was an experiment in living, working, sailing, and researching as a contained unit. It was an experience in self-awareness, group mentality, and leadership. Personal space is difficult to come by on a 30ft sailboat, especially when it is inhabited by eight people. Throughout our trip we all experienced emotional, mental, and physical obstacles. Our true growth lies in the fact that our group learned to acknowledge and deal with personal frustrations, to be vulnerable, and to rely on and trust in each other. After two weeks exploring the Exuma Islands, our crew crossed open water and returned to Eleuthera, following the path we had taken before. But we were not the same. Reflection, in my opinion, is a key component in realizing and solidifying change. The final component of our expedition was a 48 hour solo. During this time students had the opportunity to sit alone with their thoughts, write in their journals, and rest. While sitting completely alone and in silence can certainly be an arduous task for most, the students came off of their solo time with a new appreciation of their experience and understanding of themselves. Now that the first ever Expeditionary Summer Term has come to an incredibly successful and joyful end, we can reaffirm our initial thoughts to be true. This program was in fact an amazing and challenging opportunity for everyone involved. Some of the highlights of our final week back on the Island School campus include: the final Epic Snorkel physical challenge, research symposium, Parent’s Weekend, and kook of the day assignments. Our graduation and course celebration was filled with laughter, friendship, and even a few tears. Throughout the past month our 13 pioneer students gained the means and confidence to approach challenges in all aspects of their lives head on, and I have no doubt that they will continue to do so. When asked on the very last day of the course whether they would do it again, each and every one stopped to truly think it over, and then said yes.